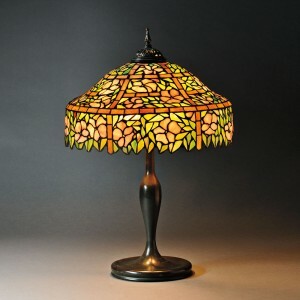 The Value of Mosaic Glass | Antique Tiffany Lamps | Duffner & Kimberly | Gorham | Skinner Inc. The fact that “Tiffany” tends to be synonymous in the American vernacular with “beautiful mosaic glass lighting” is a testament to the legacy of Louis Comfort Tiffany’s vision, and the execution of that vision by the gifted artists and craftsmen and women working at Tiffany Studios. However, not every valuable mosaic glass lamp is a Tiffany, and Tiffany lamps are not the only highly coveted examples of early modern lighting design. By the 1890s, Tiffany Studios had already established itself as a manufacturer of stunningly beautiful and masterfully executed mosaic leaded glass windows. However, it was the introduction of a new technique to hold cut glass pieces together with copper foil instead of lead that allowed them to expand their mosaic market. The traditional lead came technique used in windows was heavy and brittle, while copper foil allowed for a lighter, more malleable structure that could be built in the three-dimensional shape of a lamp shade. Thanks to patent protection on the new copper foiling technique that lasted until 1903, Tiffany was able to get a strong (and lasting) foot hold in the mosaic glass lamp market. 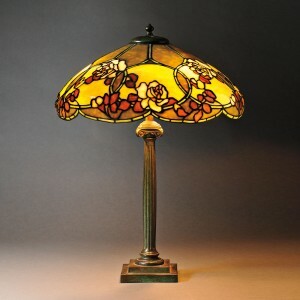 The new lamps found immediate popularity and financial success despite their relatively exorbitant cost; more people could afford a Tiffany lamp than could afford a Tiffany window. Other lighting manufacturers attempted to recreate the effect of Tiffany mosaics using lead, enameling, metal overlays, and other methods, with mostly mediocre results. As soon as the patent on copper foiling expired, the flood gates opened and the mosaic lamp market in America took off. Mosaic glass lamps surged in popularity in the early 20th century in America. Electricity was becoming increasingly common in homes, and people enjoyed the softening effect of the colored glass on the glare of new electric bulbs. Perhaps even more importantly, the lamps had become a trendy status symbol. Savvy business people saw an opportunity to profit from the clout of the Tiffany name and the ever-growing population of an aspirational middle class. 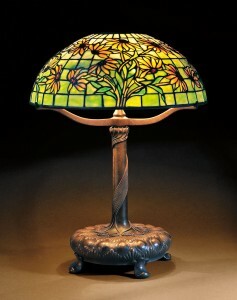 Lamps made in the style of Tiffany Studios lamps, but with less costly materials and construction, appealed to people who wanted the Tiffany look without the Tiffany price. 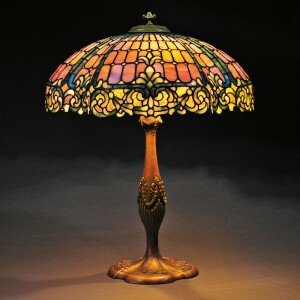 Companies such as Duffner & Kimberly, Gorham, Wilkinson, and Unique all created mosaic glass lamps, or “electric portables,” of varying quality and in a range of styles, from Victorian to Art Nouveau. This large and diverse group of second-tier mosaic glass lamps offered a more affordable alternative to Tiffany lighting at the time, and examples from these manufacturers remain an excellent option today for beginning collectors or casual appreciators of the beauty of mosaic art glass. Some of these lamps may be near equals to Tiffany in their beauty, creativity and quality of construction – yet they often come at a more accessible price. 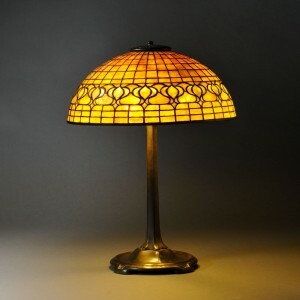 The Skinner 20th Century Design auction in Boston on June 22, 2013 features a selection of lighting by Tiffany Studios as well as other popular manufacturers of mosaic art glass lamps. 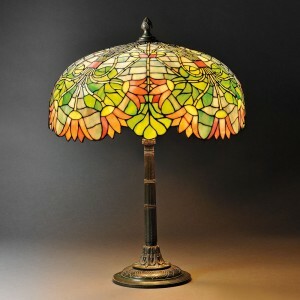 This entry was posted in Blog and tagged 20th Century Design, antique tiffany lamp, antique tiffany lamps, art nouveau, duffner & kimberly, early modern lighting, gorham, lighting design, mosaic glass lamp, original tiffany lamps, real tiffany lamp, Shannon Ames, tiffany style lamps, tiffany table lamps, value of a tiffany lamp, victorian, wilkinson by Shannon Ames. Bookmark the permalink. Pingback: How to Recognize Quality in Tiffany Lamps | Antique Mosaic Glass Lamps | Skinner Inc.
Those lamps are really beautiful. I have seen one in my friend’s house and i was totally envious about it. I want to buy even just one lamp but i think it’s expensive and i do not know how to distinguish an antique one. I feel you are off base with your comments concerning Duffner & Kimberly lamps. The quality of their lamps were equal to that of Tiffany, and sometime even finer. In many cases they cost more than Tiffany when they were made.In no way did they use lesser quality glass or construction. IN NO WAY WERE THEY A POOR MAN’S TIFFANY! !